Last in the video series on Audio Conferencing with Teams is Number Porting, this is mentioned in both the introduction and Planning videos at a high level. 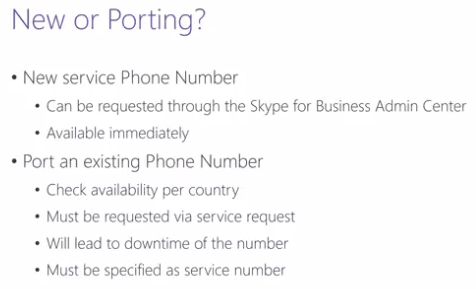 This is short video at 3.5 minutes but lets see what we learn here about porting your existing conferencing telephone number to Audio Conferencing in Office 365. The first thing we need to consider with number porting is do we actually need to keep my existing phone number ? or would a new number be ok ? 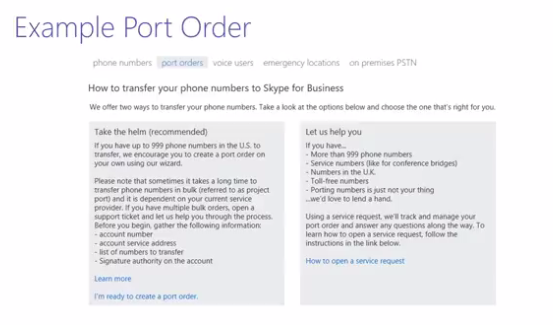 If you have a conference bridge number you rarely use and plan to use Audio Conferencing for the first time / haven’t used it before then you may not need to port your existing conference bridge number it maybe better suited to have a new service phone number instead of porting. If your ok with a new number go to SfB admin centre and voice and get a new service phone number and available immediately and available to your Conference bridge. using a new number means we dont have to port. What happens if you have a very well known conference number and you want to keep your existing number when moving to Audio Conferencing in the Cloud ? This is possible but you need to consider a number of points first ! Before you start ports check existing provider and environment in your country how great the impact will be. You can take the helm approach however this is only available for normal phone numbers NOT SERVICE NUMBERS. For Audio Conferencing number porting we have to use SERVICE NUMBERS so we need to open a service request. Ask the operator can you please port these numbers and they must be SERVICE numbers. The operator will then help you out with the process. Thats it and thank you.